Next in the series on Wilderville's Country Beef Jerky is this Black Pepper variety. See last week's review of their Original variety. Wilderville's Country Beef Jerky is a small, USDA inspected meat processor based in Grants Pass, OR. Beef, marinade (water, distilled vinegar, salt, brown sugar, hydrolyzed soy and corn protein, corn syrup, garlic, onion, molasses, black pepper, anchovies, caramel coloring, hickory smoke flavor, tamarind, sodium benzoate). The first thing I taste from the surface of these pieces is a moderate saltiness, light amounts of sweet, and faint flavors of worcestershire. Moments later the black pepper starts to come in. The chewing flavor starts with a bit more saltiness, and a bit more definition from the worcestershire. There's a light natural meat flavor noticeable, while the black pepper builds strength. For being labeled as "Black Pepper", this has a strong black pepper flavor, including a very liberal spread of cracked black pepper bits all over. The black pepper is noticeable on the surface flavors, and generates a lot of flavor in the chewing, even from the very first piece I try. But the dominant taste profile is very much like what I found in the company's Original variety, mostly a light worcestershire sauce flavor, with a touch of sweet mixed in. There's also a light natural meat flavor that tends to take a back seat to the worcestershire. 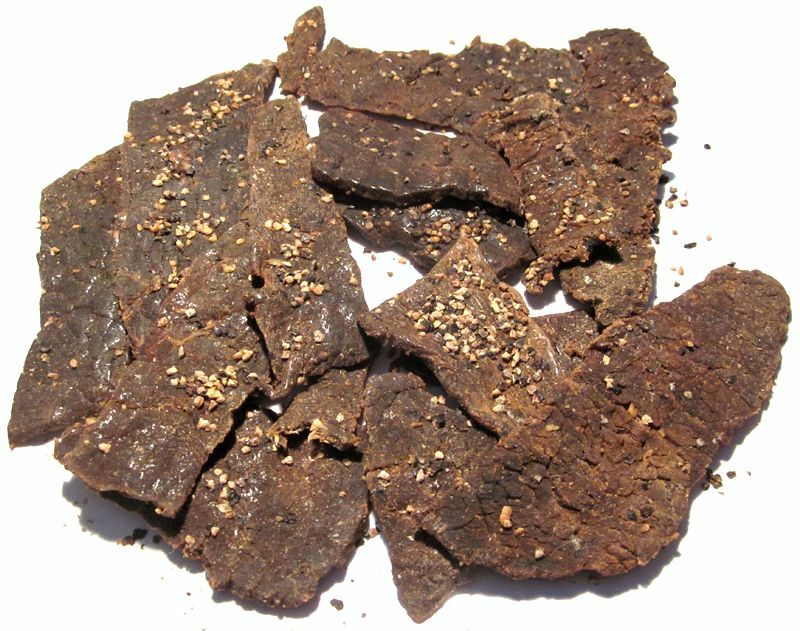 The heavy sprinkling of black pepper in this variety give this jerky an overall stronger flavor intensity than what I found in the company's Original variety. After eating several pieces of this, the black pepper builds a strong aftertaste. The saltiness overall feels to be at a medium level. This jerky also has that light onion flavor I found in the Original. Overall, what you're going to notice in this jerky is a light worcestershire sauce flavor and a light natural meat flavor, but with a heavy black pepper seasoning which builds a strong aftertaste in the back of your mouth. There's touches of sweet and touches of onion flavoring. These are slices of whole meat, sliced to a medium thickness, and in small to medium sized strips. This is a dry jerky with a dry surface feel. The strips are cut against the grain, similar to the way beef brisket is cut. They have partial flexibility in that they'll bend a little bit but will will crack open easily. Biting chunks off is easy to do, and chewing seems easy. The chewing texture starts off dry but soft, and seems to offer no chewing resistance. They break down very quickly and chew down to a soft mass with just little chewing. At that point, it has a meaty, fibrous feel, but not really like a grilled steak. The meat fibers don't mesh together and feel somewhat crumbly, perhaps due to how the strips are sliced, and how dry they are. I see only small bits of fat on a few of these strips, but encountered no gristle or tendon. I didn't encounter any stringiness nor found any unchewable wads of tissue. In terms of clean eating, it's very clean. No residue on my fingertips, however a lot of black pepper bits falling off onto my lap. 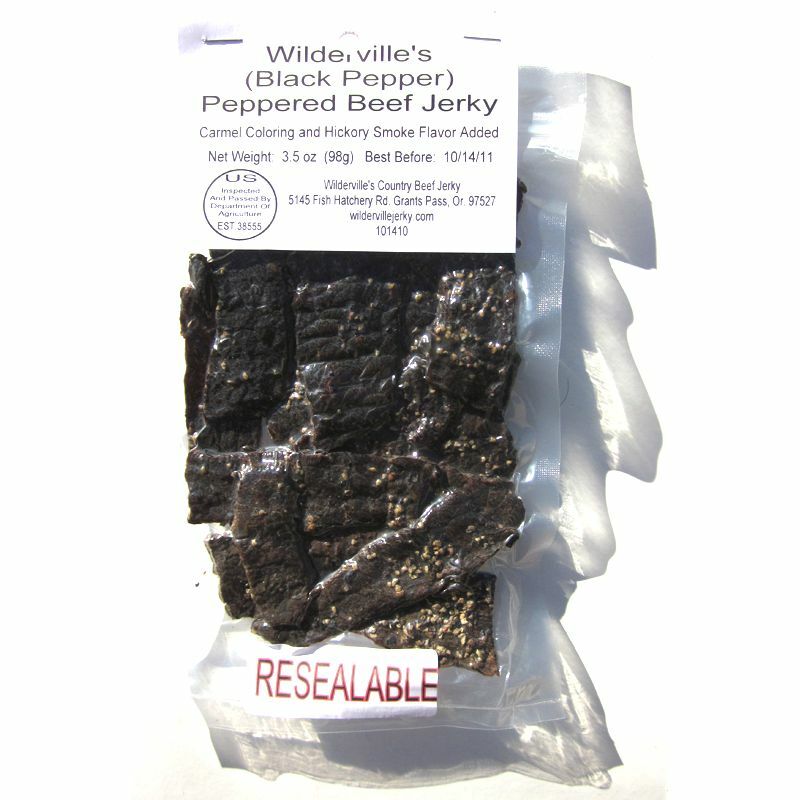 Wilderville's Country Beef Jerky sells this Black Pepper variety from its website at a price of $6.00 for a 3.5oz package. If you bought 5 packages, the shipping comes to $7.50 if sent to Southern California. That works out to a price of $2.14 per ounce. For general jerky snacking purposes, at the $2.14 price per ounce, this seems to offer a fair value. I get an average amount of snackability for an overall satisfactory flavor, good meat consistency, easy eating, and average chewing texture. That price is a little bit higher than what I'd end up paying for a major brand of jerky at the grocery store, but offers a similar snackability. As a Black Pepper beef jerky, at the same $2.14 per ounce price, it's a good value. I'm getting a lot of black pepper flavor, and a lot of cracked black pepper bits visible on these strips. 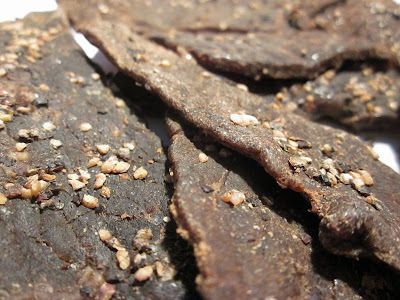 This Black Pepper variety from Wilderville Country Beef Jerky comes with a generous sprinkling of black pepper bits which kicks in a strong black pepper flavor. But it's still the lightly sweet worcestershire marinade and light natural meat flavors that tend to dominate the overall flavor. The black pepper adds a lot of bite to that flavor, and creates a strong aftertaste. Like with the Original variety, this jerky does a good job of providing quick fix to my snacking urges, and gives me something good to munch on, but I still don't see anything out of the ordinary in this. And compared to the Original variety, this appears to have the same flavor, but just adds black pepper, and has the same meat consistency, and same chewing texture. As for my recommended beer pairing, the heavy bite from the black pepper warrants a a more malty yet refreshing pale ale. Try the Widmer Drifter Pale Ale or the Firestone Double Barrel Ale.